Nepal probing ‘fake Everest claims’ of Pune Police couple - Integration Through Media ....! KATHMANDU: Nepal has launched a probe to verify the claims made by an Indian police couple of having scaled the Mount Everest after it was alleged that they faked their expedition to the peak’s summit by morphing photographs. 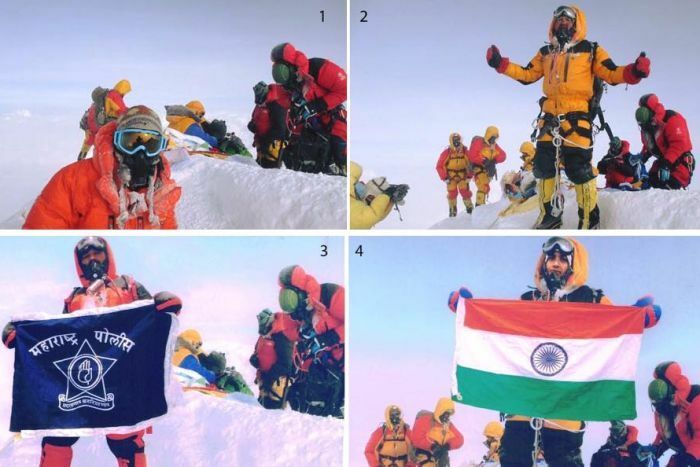 Tarakeshwari and Dinesh Rathod, who are serving as constables in Pune Police, had claimed on June 5 that they became the first Indian couple to scale the Everest on May 23. They had obtained summit certificates from Nepal’s Department of Tourism by allegedly submitting doctored photos showing them on the top of world’s highest peak. Laxman Sharma, chief at the Mountaineering Department under Nepal’s Ministry of Tourism, said authorities are probing the Everest climb made by Rathore and his wife. “The climbers have already returned to India and we have asked Makalu Adventure, the local agency that managed the expedition for clarification regarding the matter within 24 hours,” he said. The couple was issued climber’s certificates from the Nepal government after they presented a photograph of themselves on the 8,850-metre (29,035-foot) summit. Other climbers, however, say the couple never reached the summit and used some trick photography to earn their climbing certificates. Satyarup Siddhantha, a climber from Bangalore, accused the couple of plagiarising his summit photos which were taken when he scaled the Everest on May 21, the Himalayan Times reported. A source at the Tourism Department also said they have a doubt about the genuineness of the claim made by the Indian couple. If the accusation is found to be true, the couple would lose their certificates and be banned from climbing any mountains in Nepal, officials here said. A probe has also been ordered in India to verify their claims after a group of mountaineers approached Pune Police alleging that the two have faked their expedition.